Three Premier league sides have reached the Europa League last-16 round after Newcastle, Chelsea and Tottenham managed to see off the challenge of Metalist, Sparta Prague and Olympique Lyon respectively. Luis Suares’ heroics were not enough for Liverpool to progress, as the Reds lost on away goals despite winning 3-1 against Zenit at the Anfield. Shola Ameobi scored a second-half penalty before Tim Krul produced an outstanding display between the sticks to effectively deny opposition’s attackers. The Dutch stalwart was on fire that night and helped the Magpies to make it through to the last-16 round. After the mistake from Metalist midfielder Papa Gueye the goalkeeper Oleksandr Goryainov brought down Sissoko in the penalty area. Ameobi kept cool head to convert a penalty in the 64th minute of the game. Metalist had a number of attempts on goal, which promised much, but it was Tim Krul who made several quality saves in the closing 20 minutes to send his team into the next stage where they will meet Anzhi Makhachkala. Dembele’s incredible screamer in the dying stages of the game was enough for Tottenham to qualify for the Europa League last-16, as they held Lyon to a 1-1 draw in France. With the Spurs leading 2-1 from the first leg, the English side needed just a draw to make it through to the next stage. However Tottenham’s advantage was cancelled out early in the game, after Lyon took lead thanks to Gonalons’ header in the 17th minute. Lyon could have progressed thanks to away goal, but Tottenham came back from the dead in the 90th minute thanks to Dembele’s excellent effort. Tottenham are facing a tough challenge from the side of Inter Milan in the next stage of the tournament. Trailing 2-0 from the first leg, Liverpool desperately needed a win with a three-goal margin at the Anfield to make it through to the next round. 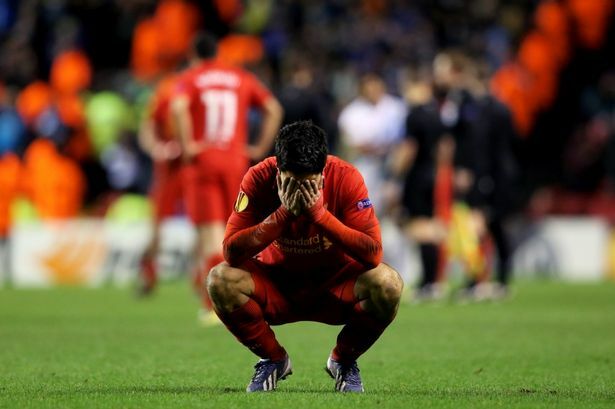 Despite the brace from rampageous Luis Suarez which contributed to a 3-1 win over Zenit, Liverpool were eliminated from Europa League on away goals. The Reds threw everything on their opponents, but failed to avoid an upset after a terrible mistake from retiring Carragher. His miskicked the ball trying to make a back pass to Reina and Hulk capitalized on his mistake to score an easy finish in the 20th minute. Suarez clawed one back netting a fantastic free-kick eight minutes later. Joe Allen’s header gave Liverpool 2-1 lead in the 43rd minute of the game. There were no prizes for guessing who completed the rout as that man Suarez has again scored a stunning goal into the top right from 30 yards. Despite having more than half an hour to score and not concede, the Reds did not manage to complete that task. They were knocked out on away goals through a brave comeback, while Carragher’s mistake proved the difference. Eden Hazard came on as a substitute and scored the goal in the last seconds of the game to give the Blues a somewhat lucky 2-1 aggregate victory. The game was close and could go either way, after Sparta Prague cancelled out Chelsea’s advantage in the 17th minute thanks to Lafata’s strike. However Hazard snuffed out the hopes of the visiting side, after dribbling past two defenders and rifling into the corner from the edge of the area. The last-minute goal sent the fans into raptures. The Blues will be playing against Steaua Bucharest in the next round of the competition.